Machine runs on Windows 98. I need to use the router to create an irregular shape. There are no other machining requirements but to cut-out a shape on a 3/4” MDF (like an egg-shape, but jagged lines). I am familiar with programming in Woodwop, but this needs to be done from an AutoCad file, as it would take forever (and would be very inaccurate) to program every segment manually. I am at a loss, as I have never done it. I do not have an AutoCad sofware, nor know how to use one. What do I need to communicate to the one who will make the AutoCad drawing, so the way the file is created meets all the requirements the Weeke and WoodWop is expecting? And …. once they give me the file, what are the steps needed from copying it onto the desktop to actually ending up with my egg like shape?? As I said..... I am at a loss. Machine has Ppp.exe file in Ww4 folder. Sorry .... make that Bpp..... was a typo. The layer names have to set right too in the DXF file .... Look at the attached PDF file for the naming. Attached is a screen cap as well of BPP5. Thank you very much for the input and the link Brent. I am looking to do this myself, not to contract it out. I have seen it done by someone I know, but he is not available at this moment. I can follow instructions step by step well, and the learning curve for this should be small as what I need done is to get the router to follow a path which is created in an AutoCad environment. I need to learn of how that is done, from layer naming to taking the file to the Weeke to creating the mpr file to cutting the egg-like shape. But to begin with, I need to know what to tell the one making the AutoCad drawing of how to make the file so the Weeke can run it. Thank you for taking the time to come to my assistance. 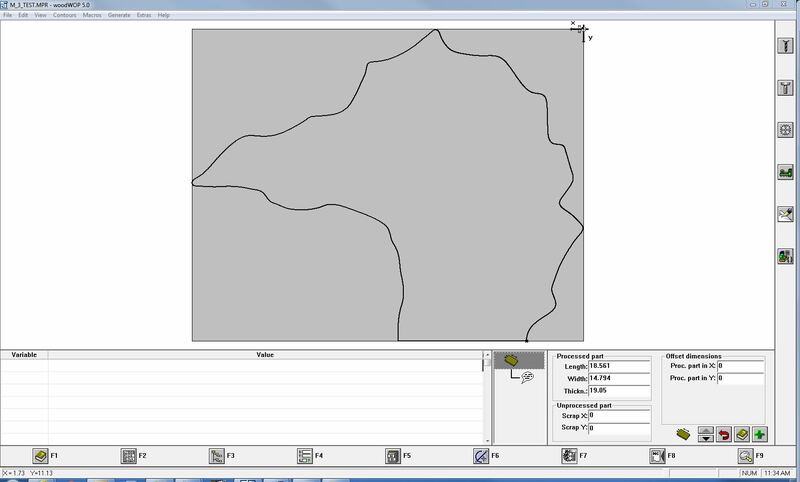 Attached is an example ellipse program from WoodWOP. Even though it is in German it's easy to figure out what the variables do. Hello Brent and thank you for your effort. I could not open the link, but I do have the WoodWOP ellipse program. The ellipse is a great tool and I have used it in the past. I am including a dwg file of a similar shape to the one I am trying to cut out with the router, so you can see that programming it one segment at a time is going to be inaccurate, or impossible. What I need (at a first stage) is to have the AutoCAD file made and prepared in a way that the Weeke can run it. This moment, the one who makes the file (this moment the drafter is not me) would have to create it with the Weeke requiremets, requirements I do not know. On a second stage, I would want to learn some basic AutoCAD, so after someone emails me a dwg or dxf file, I can turn it into mpr and run it on the Weeke. Last step would be the get an AutoCAD LT and start drawing shapes myself, or altering shapes (like splitting it into two if is two big to run as one as the bed's capacity for routing of the Weeke is 36 by 96), or changing its size. What is your location and what do you do? I am In NYC and we do work with artists (painters). Thank you for the Bpp link, I have printed the information and going thru it. The M_3_Test_WoodWOP is just a screen cap of the file converted to WoodWOP. I've put in the ProcPart_19_05 layer around the shape. Changed the spline and line to Geometry_0 layer. The Geometry_0 converts to the spline and lines to geometry and 0 is the Z level. I'd try to stay away from splines though. Because BPP and WoodWOP breaks the lines up into a million lines. Which is fine ... try to stick to polylines, lines and arcs. But it's not impossible. Also you can convert the splines to polygon cutting in WoodWOP as well. Which the layer name would be Poly_0NM12345. 0 being the Z level NM is for NM and 12345 is the file name. I'm in Wisconsin ... work at a wood mfg doing CAD/CAM. Came from the metal side of things years back. Used AutoCAD, SolidWorks, Inventor and MasterCAM. Now mainly use AutoCAD, AlphaCAM, Genesis for Busellato and WoodWOP. Hope this helps you out....good luck! Ugh .... didn't like the file extension. Try this instead. Rename .PDF to .ZIP after you download it locally. If this doesn't work I'll share it via Google Drive. Brent thank you for going out of your way to help. I will go over the information most likely tomorrow and during the weekend. You have been great help and it has not gone unnoticed. I do appreciated your help very much, as we are all defined by IF we come to someone's rescue when there are no benefits to reap. Note that the machine 0 parm. can be wrong and cause your machine to crash. Caution is advised from my past discussions with woodwop. ....."as we are all defined by IF we come to someone's rescue..."
We are defined by the truth. Life is most important in life. That's not only true, but the most important truth in life. We are life and most important, as define by the most important truth in life. What we do does not define us. Our actions are only an indication of our capacity of behavior, nothing more. I tested an egg shape with SmartLister last night. It worked, but it took a few minutes to process. You'll need a tool like acad has, 'pedit'. pedit, enter, select the spline, y (yes convert to pline), enter, s (spline), enter, enter. pedit, enter, select the spline, y (yes convert to pline), enter, f (fit), enter, enter. That will give you the arcs. So Brent, with all your information and the assistance of someone who knows AutoCAD, I did manage to get the file to the Weeke. It would not generate and the message was in German, but I figured it out as the number 6.45 was there, and that is half the diameter of my bit. Bit is 12.9 mm. What the problem was, there are contours in the drawing that are less than 6.45 and the machine could not do them….. So I said, lets do a dry run….. removed all pods, hit the pedal and it went to work……. BUT….around midpoint it stopped … like frozen but with the router still running…. Then few seconds later it gave me a new message whose number I do not remember it now, but it basically said (in English this time) that the tool’s diameter is not proper for the depth…… and I can not figure it out. My assumption is, there is a line segment somewhere in there that is shorter than 12.9 mm, and it connects with another segment which is in an angle to the first one and does not allow the bit to reach the full length of the first line. Then it was time to leave work, as it was late last night. Not sure about your machine setup .... but I now put a tool on the path for you. In the DXF file using the V_Trim layer name. I also imported the CAD file to AlphaCAM, convert the spline to geometries and then tooled it. See the attached JPG. Note! I sat the Z depth to cut through! Thank you very much Brent, I will go thru your information during the day or evening.